Here in Toronto this year we have been having an exceptionally cold and snowy winter! Despite the weather, some of our feathered friends have remained in our outdoor classroom. One day when we were outside, some children began to wonder about the birds – weren’t they cold? How were they finding food under all this snow? 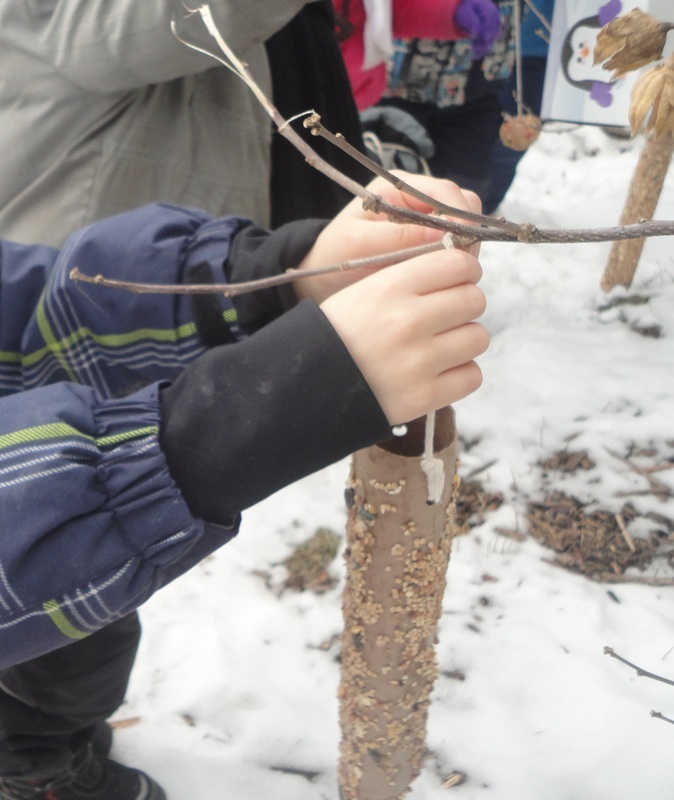 After reading Ricki’s Birdhouse by Monica Wellington, a book about a boy who constructs a birdhouse for the birds in his yard and proceeds to feed the birds throughout the year, the children were interested in making their own bird feeders for the birds in our outdoor classroom. 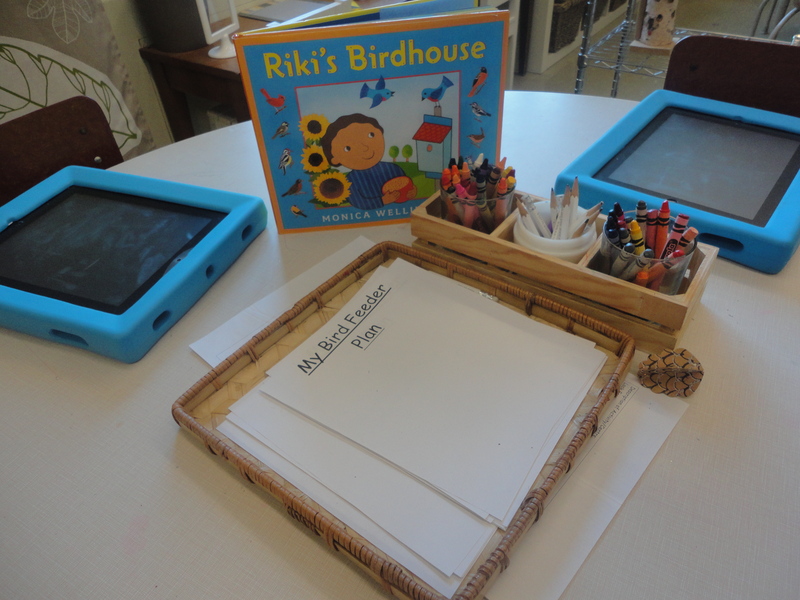 We set up a provocation at the science table including planning sheets, our Ricki’s Birdhouse story, and iPads. 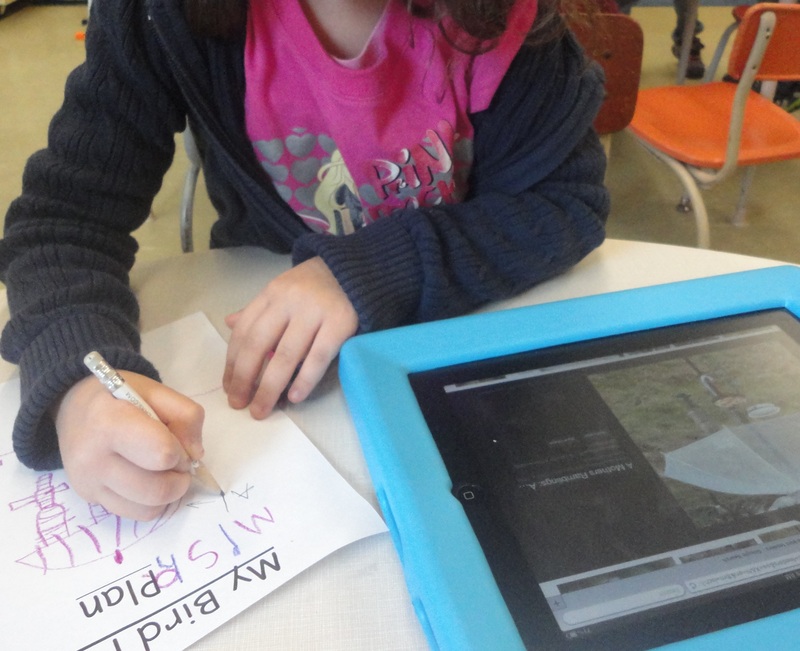 Using the iPads, we googled “homemade bird feeder” images and the children looked for designs that appealed to them. Then they set about creating their plans. We encouraged the children to label their plans with the materials we would need to build them. 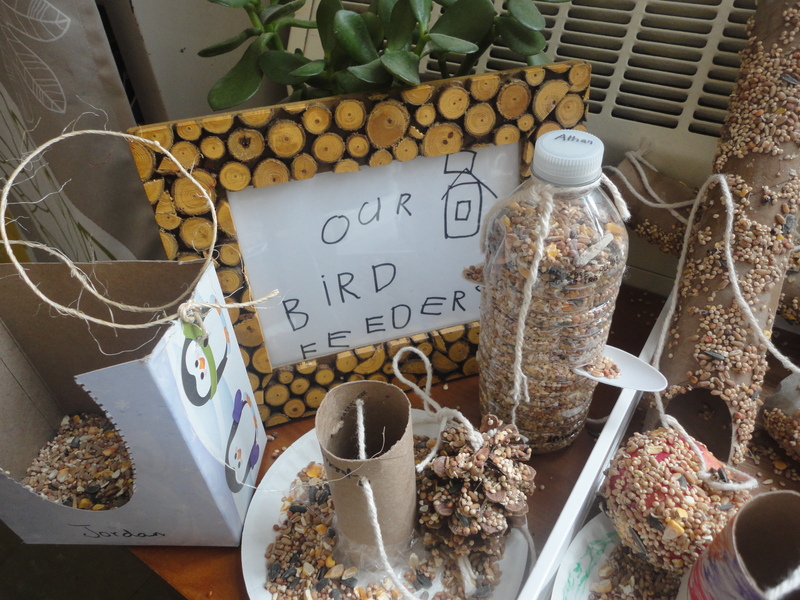 After giving the children ample time for the planning process, we gathered up the materials the children requested for their bird feeders. I sent a letter home asking the parents to send in any materials they may have at home to help us with our project. Then we set up our bird feeder making centre! 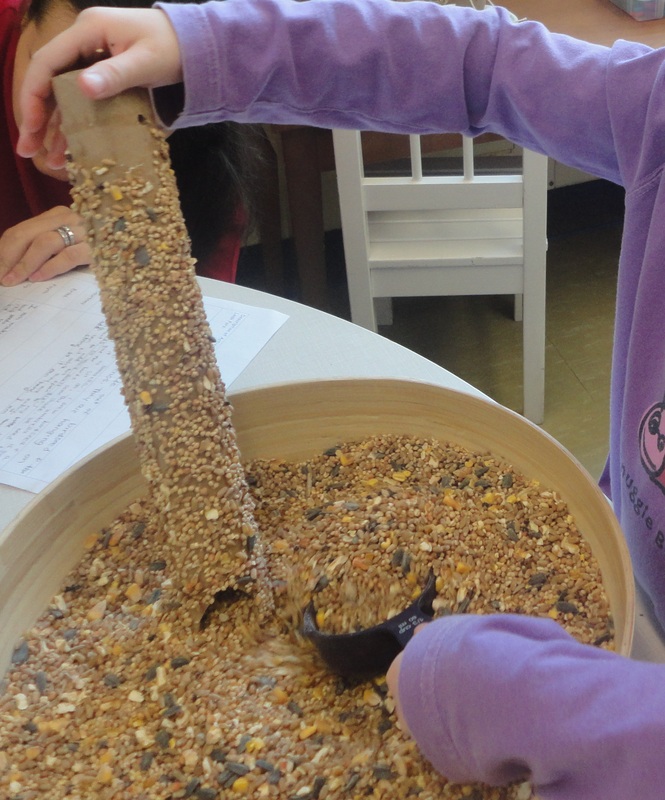 For the most part, the children really stuck to their original designs when making their bird feeders. Other children who weren’t initially interested in making their own plans stopped by and got inspired by their classmates’ projects. 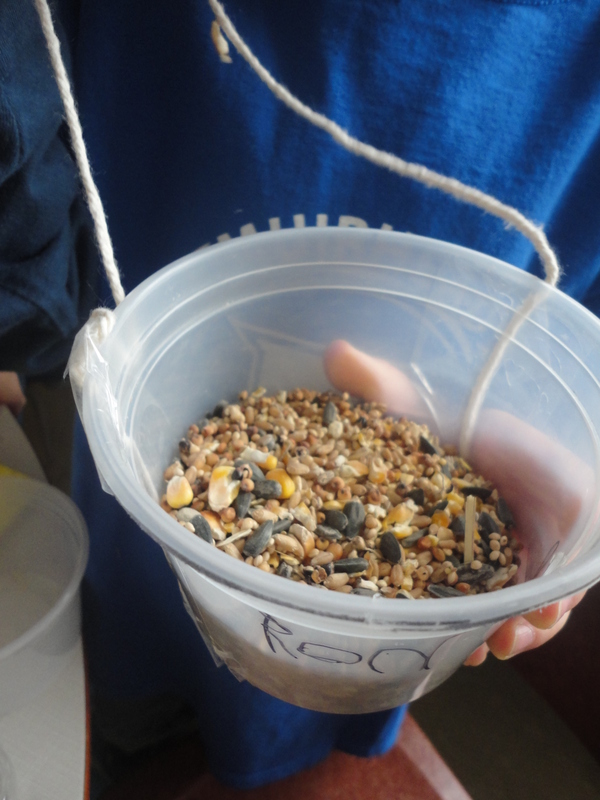 The children were really in charge of this activity from start to finish, and were so proud of the feeders they made! At the end of the week, we took our feeders outside to hang up in the courtyard. The children were beyond excited to share their creations with the birds. It felt like a bird feeder hanging party! Update: After the weekend, we took the children outside to see if there were any clues that the birds had enjoyed the birdseed. We had had another dose of snow, so the children noticed that some of the materials we used did not hold up in the extreme winter conditions. E.A. : The bird feeders made of Kleenex boxes and toilet rolls with honey stayed up. F.S. : The snow covered the paper plates and they fell down. A.C.: The tissue boxes and the buckets are good to make feeders because they stayed up. J.M. : The apples stayed up too and some of the food was missing. M.F. : The bird seed is gone! B.L. : That’s because the snow is covering the seeds. I can see it if I dig down. H.K. : I think the birds look fatter! 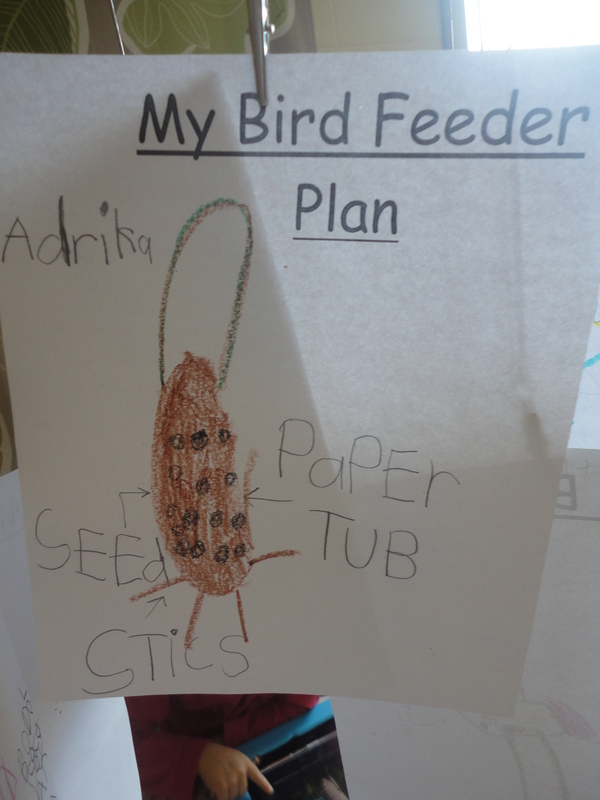 This entry was posted in Outdoor Classroom, Parent Involvement, Science and Technology, Writing in Kindergarten and tagged bird feeder project, bird inquiry, outdoor classroom, planning in kindergarten, Reggio inspired kindergarten, Ricki's Birdhouse, technology and inquiry, technology in kindergarten by msmcdonell. Bookmark the permalink. I just found your site last week. What an inspiration. I have been teaching Kindergarten (now ELP) for 9 years and have slowly been changing my approach to teaching. I love being able to look into the classrooms of others to get ideas and read about the journey of other ELP teachers. It is now the March Break, so I am doing what most other ELP teachers (and other teachers) are doing… thinking about the learning and interest of my students! What else do I have to do on my break!?! Last week, just before the break, many of my students took an interest in the birds that have seemed to awaken for spring. They were excited to see the birds at our windows and on the play yard. Our class is full of designers and builders, so we always try to have a building provocation table (building bridges, building boats, etc) so I was trying to figure out what new building provocation table I was going to present when we return. Never even thought about building bird feeders, until I spent time looking at your site. Bingo!!! What a fabulous idea. Thanks so much. Hi Lisa! That’s great! I’m so glad you found some inspiration here. Let me know how it works out!